Herb quality is of the utmost importance to us. 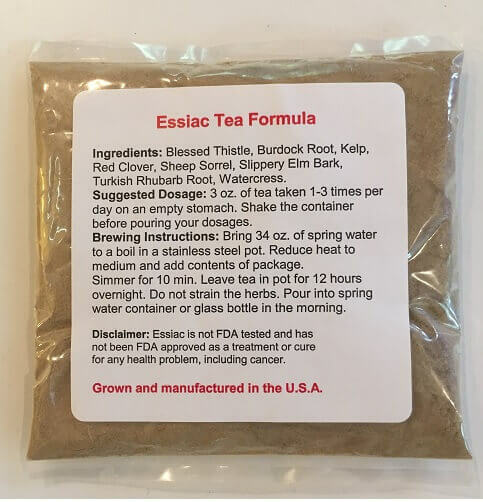 At discount-essiac-tea.com, we choose the herbs we need for our essiac formula based on which herb companies can offer us the highest quality organic herbs at the lowest price. All of our herbs undergo rigorous testing for quality control, safety and purity. Click here to view information on herb quality control from the company who supplies us. The eight essiac herbs (blessed thistle, burdock root, kelp, sheep sorrel, slippery elm bark, red clover, turkey rhubarb root, and watercress) come from Starwest Botanicals, Inc. in California. Click here for information on Quality Control of these herbs. Click here to view information on herb quality control from the company who supplies us. Many customers have commented on how fresh our herbs look, smell, and taste. If you purchase essiac from an outlet that sells more than one herbal formula, you're much more likely to receive stale herbs. We carry essiac and only essiac at discount-essiac-tea.com, and we sell a lot of it. Because of this, we never have stale herbs sitting around. Herb quality can deteriorate as the months and years go by, and you'd be shocked at how old the herbs can be from companies who don't specialize in essiac like we do. Powdered herbs make a more potent brew. This is because there is more surface area on powdered herbs, which better allows the extracts to seep into the tea. Anything in powdered form mixes easier and more thoroughly (Kool-Aid comes as a powder, not a hard stick, for a reason!) Furthermore, powdered herbs are fine enough that they can be consumed along with the tea. This is beneficial because herbal medicine is not an exact science--no one knows for sure how some of the herbs work their magic. If you consume the herb particles in addition to the tea itself (which is only possible when you brew powdered herbs) your body will receive all of the beneficial compounds present in the herbs (This is a similar argument to those who tell you to eat the whole fruit versus drink the juice or swallow a capsule. By consuming the herbs along with the tea, you won't miss out on any of the important chemical compounds). In fact, we believe so strongly in the powdered form of essiac that we carry only powdered herbs. We believe so much in the eight herb essiac that we won't sell anything else. The first essiac in use by the Canadian nurse Rene Caisse was eight herb essiac. Four herb essiac (with three herbs drank as a tea and one herb injected) was tested for a brief period of time but was not widely used by Caisse, and was never accepted as a superior formula by Caisse. In our years of experience with essiac, we have observed that four herb essiac is not nearly as effective in improving health as eight herb essiac. Approximately 80% of our customers who were ill believe eight herb essiac is a big component of their recovery from cancer, diabetes, and other health problems. We haven't seen nearly as much success in those using four herb essiac. The current-day eight herb essiac was specifically designed to be most effective in improving health and eliminating toxins in the body when taken orally as a tea. In the past, other formulas including four herb formulas were used but they were designed to be administered partially by injection. We have tens of thousands of satisfied customers who are healthy and continue to take eight herb essiac at maintenance dose after their test results have returned to normal. They will attest to the efficacy of eight herb essiac and to the fact that they believe it is superior to four herb blends. We would probably make more money if we sold both eight herb and four herb essiac, because some people have been mislead to believe that four herb essiac is better or is the "genuine" essiac. However, we refuse to compromise ethics simply to make a few extra bucks. We test each and every batch to ensure herb quality is at the highest it can be. We only ship herbs of the highest quality to our customers. To read about how some companies attempt to mislead you by calling their formula "Authentic Essiac" click here.